Athens, Ga. – The University of Georgia School of Law has named the inaugural class of its Distinguished Law Fellows program. This elite fellowship program offers three law students annually the opportunity to receive a unique legal educational experience that includes domestic and international externships and guided research experiences, opportunities to meet some of the country’s top legal leaders and a full-tuition scholarship. The fellowship is reserved for students who demonstrate extraordinary academic achievement and exceptional professional promise. The Distinguished Law Fellows program is modeled after the university’s prestigious Foundation Fellows program for undergraduates. It is a result of a $2 million founding gift from The John N. Goddard Foundation that was facilitated by foundation trustees and UGA alumni Robert G. “Bob” Edge and John G. “Jimmy” Alston Sr. All but one of the trustees of the foundation are children or grandchildren of Elkin Goddard Alston and Philip H. Alston Jr. The Philip H. Alston, Jr. 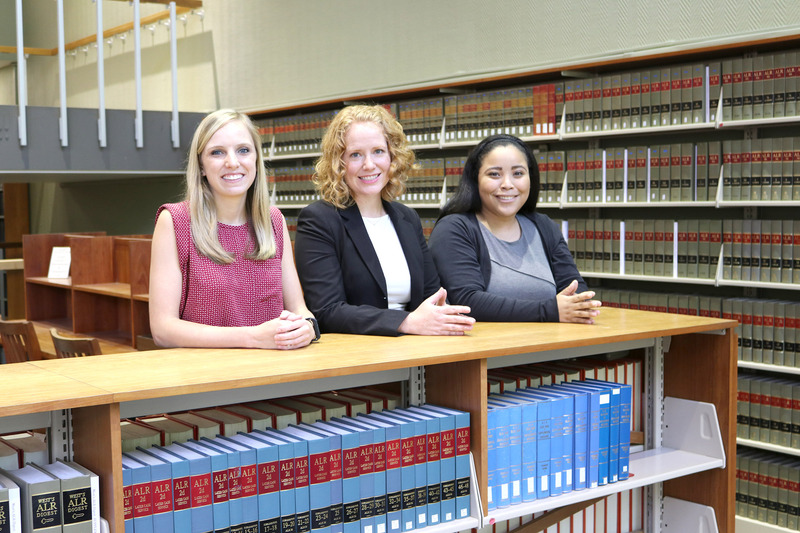 Distinguished Law Fellows for 2016-17 are first-year law student Lindsey R. Bunting, second-year law student Taryn P. Winston and third-year law student Katherine G. “Kate” Howard. • A professional development stipend to be used at the end of the fellow’s first and second years of law school for summer externships, study abroad offerings or research projects. • Special travel opportunities to meet some of the nation’s foremost legal advocates and jurists, including U.S. Supreme Court justices. The law school’s dean will serve as the guide for at least one of these trips. It is the goal of Georgia Law, and the Goddard Foundation’s desire, that the program will be expanded to allow for other named fellows so that Georgia’s flagship law school can offer quality education, professional development and an enhanced experience to its students. Philip H. Alston Jr., who received his undergraduate degree from UGA, was a confidant of former President Jimmy Carter and a former ambassador to Australia. He was a leading member of the State Bar of Georgia; helped to form one of the country’s most prominent law firms, Alston & Bird; and was an innovative leader at UGA, especially with regard to the University of Georgia Foundation. Consistently regarded as one of the nation’s top public law schools, Georgia Law was established in 1859. Its accomplished faculty includes authors of some of the country’s leading legal scholarship. The school offers three degrees-the Juris Doctor, the Master of Laws and the Master in the Study of Law-and is home to the Dean Rusk International Law Center. Georgia Law is proud of its long tradition of providing first-rate legal training for future leaders who will serve state and nation in both the public and private sectors. For more information, see www.law.uga.edu.